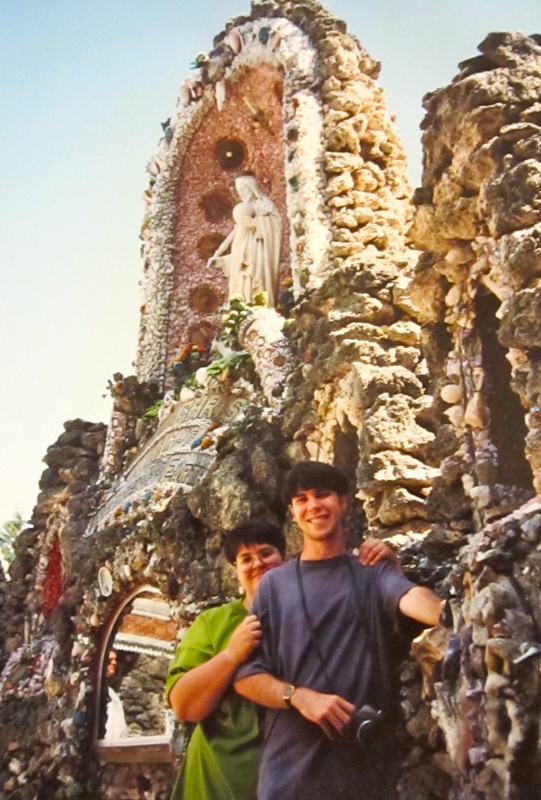 Today’s flashback is a photo of my brother, Matt, and me at the Dickeyville Grotto. It isn’t an especially extraordinary photo, but there are so many elements in that are important to me. First, one of the best things about that time of my life (late 80s/early 90s) was the fact that I lived in Iowa City at the same time as my three youngest siblings. We spent a surprising amount of time together – by choice – developing strong relationships as adults. My brother, Matt, in particular encouraged me to explore interests that were beyond the scope of my very mainstream, straight, path. With his girlfriend (and to this day one of my favorite people) Syndy, we visited galleries, attended readings and plays, checked out all kinds of odd and unusual things and places: St. Isaac of Syria Skete, anyone?! The Dickeyville Grotto has loomed large in my imagination since childhood. This particular trip taught me to think of it as not just the result of a crazed religious fervor, but as outsider art. Matt took tons of photos of the grotto and its varied elements. My Dad took photos of us enjoying the lengthy exploration of the grotto (this was the umpteenth time we had been to the grotto, but we were seeing it with fresh eyes). It is no accident that I am hiding behind Matt’s shoulder in the photo. Of course, I hoped to hide my bulk, as my weight had been creeping up. But it is also indicative of the fact that Matt boldly walked into life experiences, while I often crept along in his wake. However, I will always be grateful to have had the opportunity to learn and explore so much from and with my youngest sibling.